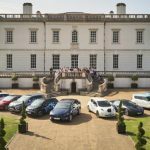 With the announcement of the 2040 ban on all new petrol and diesel cars, we get behind the wheel of three electric vehicles to see if the future really is green. Since the announcement of the 2040 ban on new petrol and diesel cars, all you read in the news is about how we’re all going electric. 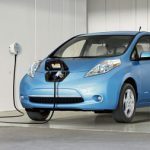 So if that’s the case, which is the best electric car to buy? 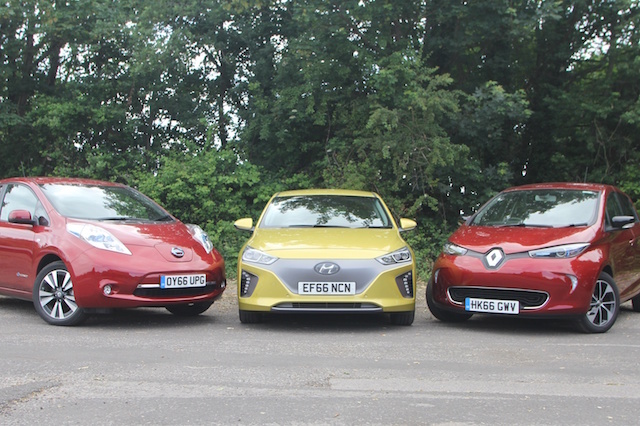 We chose three to test – a Renault Zoe, Hyundai Ioniq and Nissan Leaf. The Hyundai Ioniq is by far the newest and in our opinion one of the best-equipped. 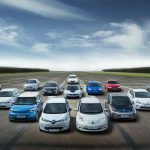 The Nissan and the Renault have both been around for some years now, and the Leaf is actually due to be replaced by a new model next year. The Ioniq is Hyndai’s first attempt at making an all-electric car, and it’s very good. Inside, the cabin feels solidly built and very comfortable. It also has lots of kit including, on our car, heated and cooled electric seats. 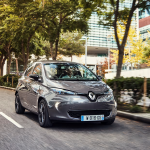 Next is the Renault Zoe, a great-looking little car with bags of character on the exterior alone. Step inside and it’s also a funky place to be. It also features the best-claimed range of the three EVs, with 250 miles on the NEDC cycle thanks to its new ‘Z.E. 40’ battery. 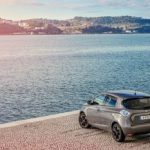 Finally, we have the Nissan Leaf, the oldest of the three in terms of design and this shows in its rather ungainly styling and outdated technology. It also has the lowest theoretical range with just 155 miles. This is where the Nissan Leaf falls down – massively. It is not appealing at all on the outside with its bulbous rear-end and huge headlights. This continues inside where it can best be described as dull and old-fashioned. The Hyundai is in a different league. It looks fresh, funky and modern. Add a touch of colour and you have a car that will be very enjoyable to own. This continues inside too where it feels light and airy with a very easy to use dashboard and centre console. The Renault is the best looking of the bunch. Its chic Parisian styling blends well with modern life and makes it look more premium than it actually is. However, this doesn’t quite continue inside. 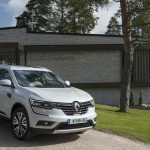 Although the cabin looks chic, it feels cheap, with the plastics belonging in a cheap supermini. This topic contains 3 replies, has 1 voice, and was last updated by Jo Pegram-Mills 1 year, 7 months ago. The topic ‘EV triple test: Hyundai Ioniq Electric v Renault Zoe v Nissan Leaf’ is closed to new replies.